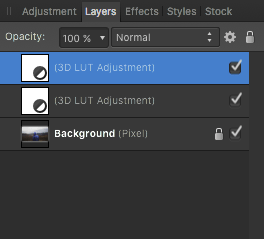 Lutify.me | How can I change the strength/opacity of the 3D LUTs in Affinity Photo? How can I change the strength/opacity of the 3D LUTs in Affinity Photo? 3D LUTs in Affinity Photo are applied in adjustment layers. Therefore, changing their properties is just like changing any layer’s properties. In order to reduce the strength of a 3D LUT, you should reduce the opacity of the 3D LUT adjustment layer. 1. 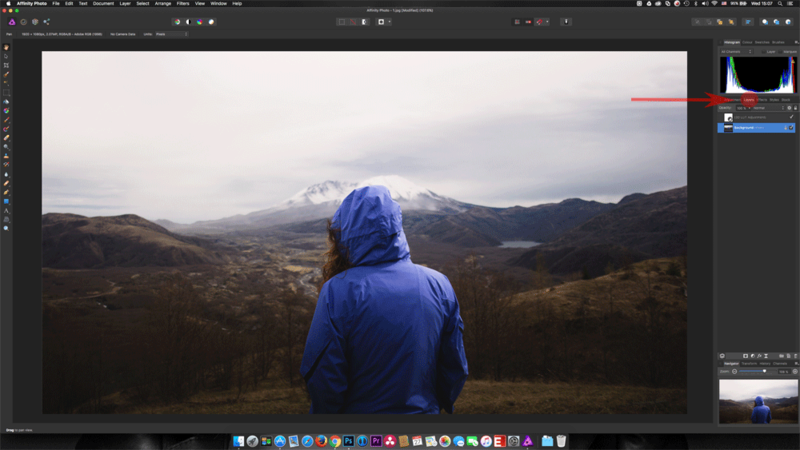 First learn how to apply a 3D LUT in Affinity Photo by visiting document “How do I apply 3D LUTs in Affinity Photo” above. 2. Inside the 3D LUT window, you can change the opacity to a lower value. 3. 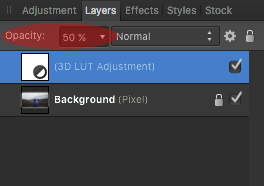 Alternatively you can change the opacity of the 3D LUT adjustment layer in the Layers Panel. 4. You’ve successfully lowered 3D LUT’s opacity. 1. Go to Layers Panel tab. 2. 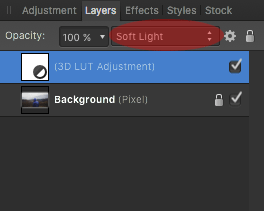 Select the 3D LUT adjustment layer by clicking on it. 3. Go to Layer > Duplicate or press Command + J (Mac) or Control + J (PC). 5. 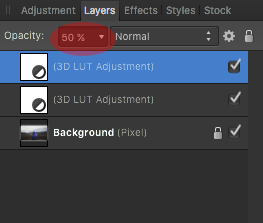 Reduce the opacity of the top most 3D LUT adjustment layer if the last layer duplication makes the effect to strong. 2. Change the blending mode of the selected 3D LUT adjustment layer until you reach the desired effect. Please note that changing the blending mode will change other characteristics such as contrast, brightness, etc. Please refer to official Affinity Photo documentation for detailed explanation about different blending modes and their effects. If you’d like to reduce the strength of the effect, reduce the opacity of the 3D LUT adjustment layer. Under Opacity, reduce the opacity of the 3D LUT adjustment layer until desired.